Carrie Bee Creates: 2018 Planning Party!!! Obviously I could use a good excuse to write a blog post, it has been awhile! So I'm joining the #2018PlanningParty hosted by Quilting Jetgirl. As we near the end of 2017 I'm proud of my quilty accomplishments. 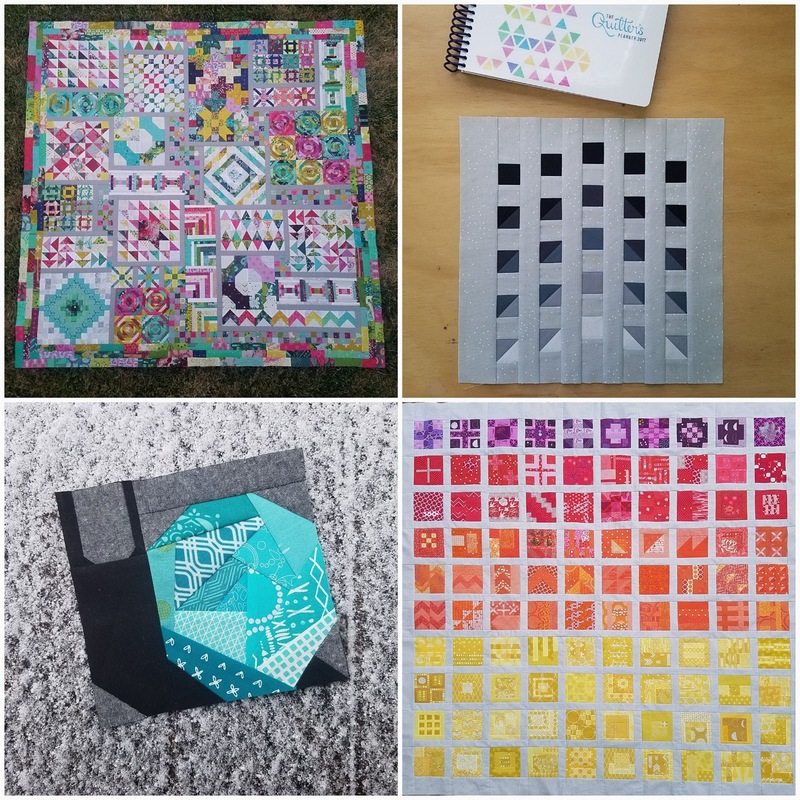 I'm an "all or nothing" kind of person so during the first part of the year I overcommitted with the 52 Weeks with the Quilter's Planner SAL, the Garden Snails Quilt SAL, the Long Time Gone SAL, and my second go at 100 Days 100 Blocks. These were the major projects, but you can see a few other random makes scattered through my Instagram Feed. I'm really happy with everything I worked on, but it took a lot of time and as a result other things were neglected. In fall I did start a few other SALs and projects but I really needed to find more balance and not let them take over. I needed to prioritize making lunch for my kids and being a swim Mom. This left little time for sewing and that is okay. I'm back at it a bit more, and excited that I'm almost finished with my Wayward Transparancy Quilt (blog post to come!). As I near the end of my second year as a piecer/quilter I have been reflecting on how my work has evolved and where I'm at now. Through practice I feel like it is inevitable to become more skilled in the technical and creative aspects of piecing/quilting. I do feel more confident in selecting fabric and putting it together. Or at least more confident in what I like and what I want to create. I can only see this evolution continuing. When I started I was all prints, no solids. I couldn't envision having any desire to work with solids. Now that is where I am drawn. I never imagined working without a pattern created by someone else. And while I still primarily working with the guidance of patterns by others, I have more of my own ideas and feel like I am able to bring my own spin to things just a little more than before. I want to see where 2018 takes me creatively and how I continue to evolve as a maker and creator. So what are my plans an resolutions for 2018? Really just continuing to strive for balance and keep growing. I do have a wild idea for a very small niche business that would use my sewing skills. I'm not sure if I will actually keep going with the idea, but it is fun to consider. I've been cross stitching when I'm places that I can't sew and I'd like to keep doing that and maybe get back to knitting a bit. And I'd really like to be better at blogging. 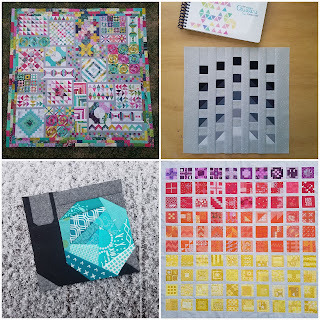 I always had the dream of participating in the New Quilt Bloggers Hop but I'm never able to meet the minimum post requirements (I'd rather be sewing!). Maybe I can step up my game for 2018.... We'll see! 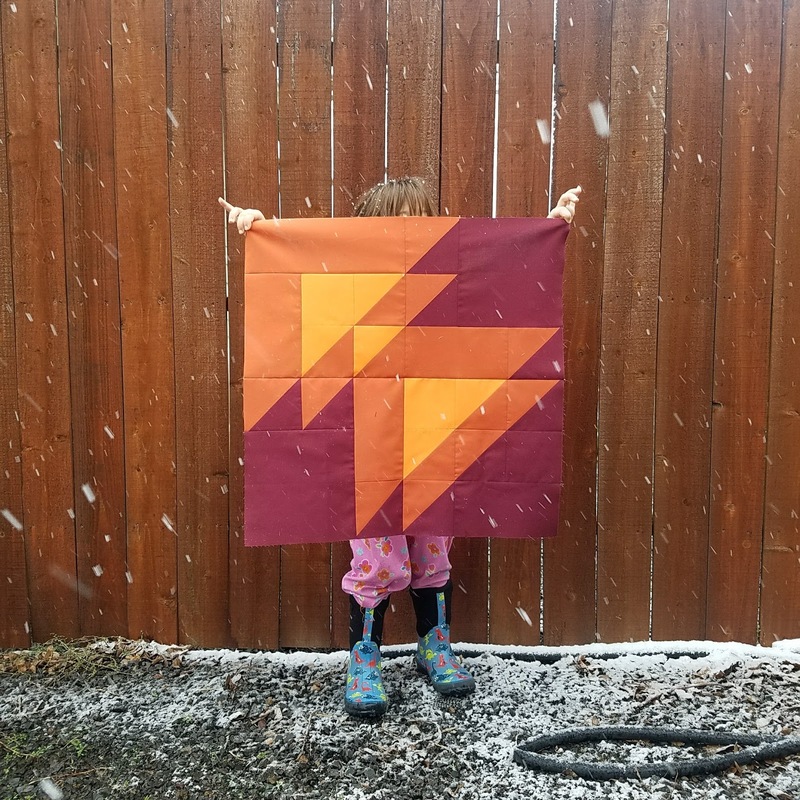 I am so grateful to Yvonne AKA Quilting Jetgirl for giving me the push to write a new post and for the nudge to really reflect on this past year and what is ahead for 2018! Looking forward to seeing the other #2018PlanningParty posts!!! You're only in your second year as a piecer/quilter?! Wow, you've accomplished so much in such a short time. It took me at least five years to develop confidence in fabric selection, and I still don't have full confidence yet. You're also much faster at developing your own style and figuring out your likes and dislikes. I like pretty much everything! I wish you the best in your growth for 2018. Thank you so much for joining the Planning Party and my Wayward Transparency QAL, I'm deeply honored. :) I always think that striving for balance is my top goal for life and any year, and I wish you a peaceful and joyful 2018. I like your "keeping it real and family friendly" approach. 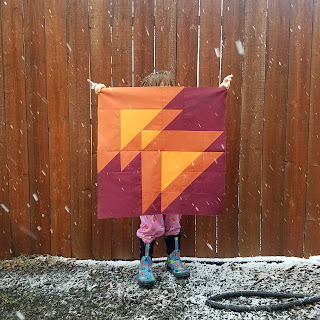 I am amazed that you've only been quilting for 2 years. Your work is beautiful and shows you have a lot of talent for this quilting stuff. You have accomplished so much for a new quilter! I tend to over commit to things as well & I'm a sucker for a good QAL! Balance is an important thing for me as well. When things get chaotic, I tend to loose focus! Wishing you lots of making in the coming year!